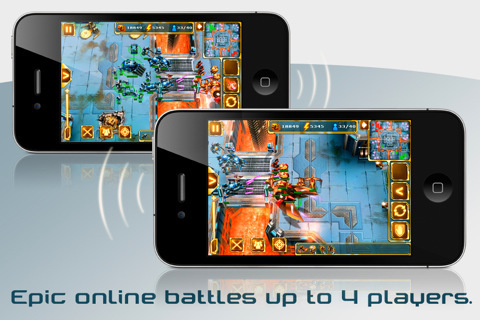 Startfront: Collision is Gameloft’s latest real time strategy title for Apple’s iPhone, iPad, and iPod touch. Borrowing heavily from popular RTS console titles such as Blizzard’s Starcraft, Starfront provides 20 unique missions spanning 5 scenic, 3d rendered environments and over 50 unit and building types, making for hours of engaging real time strategy gameplay. 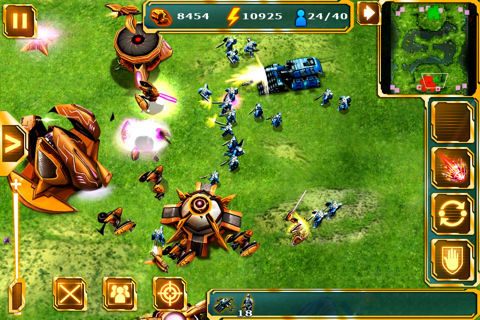 While some RTS titles have fallen short of expectations due to clumsy controls on the iPhones small screen, Startfront Collision manages to overcome to take full advantage of the iDevices touch capabilities with intuitive controls making it easy to select and build units and navigate the game map. The majority of the gameplay will feel familiar to anyone who has played RTS titles in the past, and will have you completing objectives while managing resources, using grudges to construct buildings, and navigating party members through battle. While occasional high-quality cutscenes provide some authenticity to the storyline, the majority of the game’s story is told on retro feeling dialogue boxes lacking any voice overs or depth. Apart from Starfront’s solo campaign, online multiplayer and local multiplayer over WiFi and bluetooth add countless hours of gameplay and replayability, while a long list of achievements provides incentive to progress through the sometimes repetitive objectives. All in in all, Startfront has proven to be the closest a developer has come to creating a truly engaging RTS title that lives up to the computer titles it no so subtly try to imitate. At $6.99, we have no problem recommending Startfront Collision as our top RTS pick on the App Store.